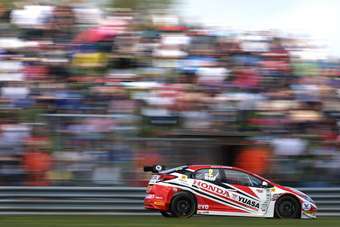 Blog: Has the BTCC returned to its glory days? For me, at least, the best years of the British Touring Car Championship was the era of the Volvo 850 estate. But after spectating at this past weekend's Thruxton round I reckon 2013 is turning out to be classic year. Granted, it was sunny, the Hampshire circuit was simplicity itself to get in and out of, and I must declare I was the guest of Honda GB. Yet, the friend I took was as keen as me to spectate not in front of the TV in the VIP marquee, but instead from out in the fresh air. That meant elbowing our way into a couple of corners (we were polite and waited until some people moved, honest) and unlike, say, F1, you can get relatively close to the action. The Honda people were obviously overjoyed with their three wins in as many races on the day, but I have to say, the racing was super-competitive. Imagine a formula where an obvious rear-wheel drive contender such as a BMW 125i can tackle an MG 6 or two, as well as Civics and assorted others such as a Volkswagen CC, an Insignia (you'd think that one would be too big, but no), an Avensis, a Leon, a Golf, an Audi A4 and even a Proton Gen.2 - with the first 15 cars separated by just five seconds after the first free practice session. I had intended to get out and see more motor racing this year, so that's the BTCC ticked off my list. Next? I'm going to give the Goodwood Festival of Speed another chance after swearing off it after the sweaty crush of 2011, but before then, a new one for me, the Cholmondeley Pageant of Power (I'm practising both my spelling and pronunciation) in mid-June. Let's hope the gods of sunshine are looking down favourably on England for both of those.